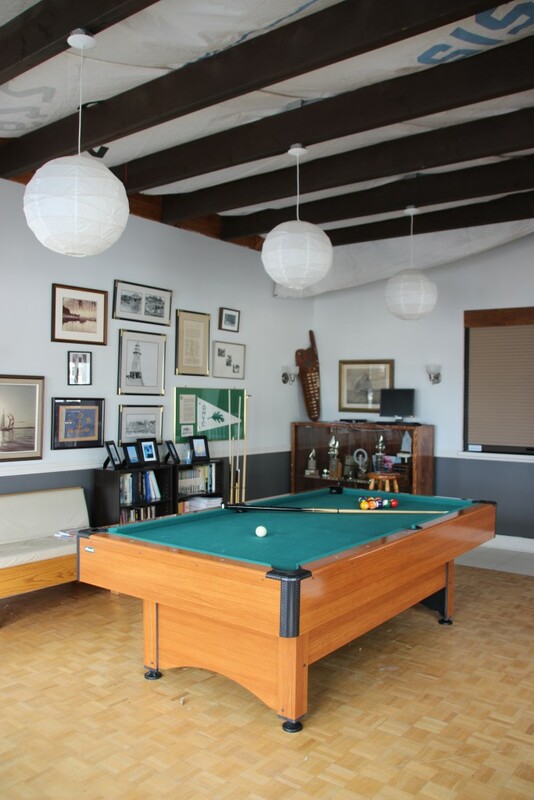 The main clubhouse contains a bar, the Tempest Lounge, kitchen facilities, ping pong table, pool table and an exchange library. On cool evenings you are invited to snuggle up around the fireplace. The Crow's Nest is a private lounge with comfortable chairs and an elevated deck from which to watch the goings on in the harbour. Join us in the main clubhouse at the Tempst bar to wet your whistle. The bar is open during the summer on Wednesday evenings at 6:30pm, Thursdays at 7:30pm, and Fridays at 5:30pm and for all special events. All winter join OYS in the Crow's Nest on Thursdays at 7:30pm for pub night. We have gas BBQs which you are welcome to use. Please make sure to clean the BBQs after use. Please do not use rail-mounted BBQ on your boat or on the docks. If you can't fit under the bridges, the closest fuel is at Bronte Outer Harbour Marina, 3 miles west. Please call 905-827-7575 to confirm hours of operation. 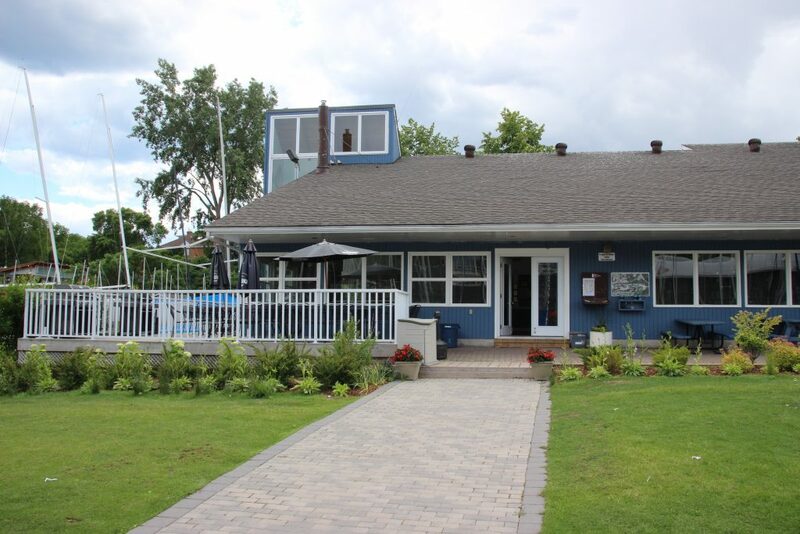 Our guest washrooms are located on the north end of the clubhouse, facing the creek. These units are complete with showers. Door access code is required. A second set of washrooms, showers and change rooms are located on the lower level of the Crow's Nest building. Extensive paths along the lake and 16 Mile Creek will keep you active. Bring your paddle accessories for perfect paddling conditions up the creek in this beautiful historic Ontario town. Click here to download a map of the surrounding area. The Town of Oakville operates the pump-out just up and across the creek (on the east side). It is open Wednesday and Friday evenings 4pm to 7pm, and Saturday, 9am to 1pm. At other times you can arrange for service by calling 905-338-4172. Also at Bronte Outer Harbour Marina. Ice is available in the freezer on the north side of the clubhouse. $2.50 per bag of cubes or a block. Please drop exact change in the slot marked for the purpose. A 1000 lb mast crane is available to members for stepping/unstepping masts and a 4000 lb launch crane is available for dry sail boats. 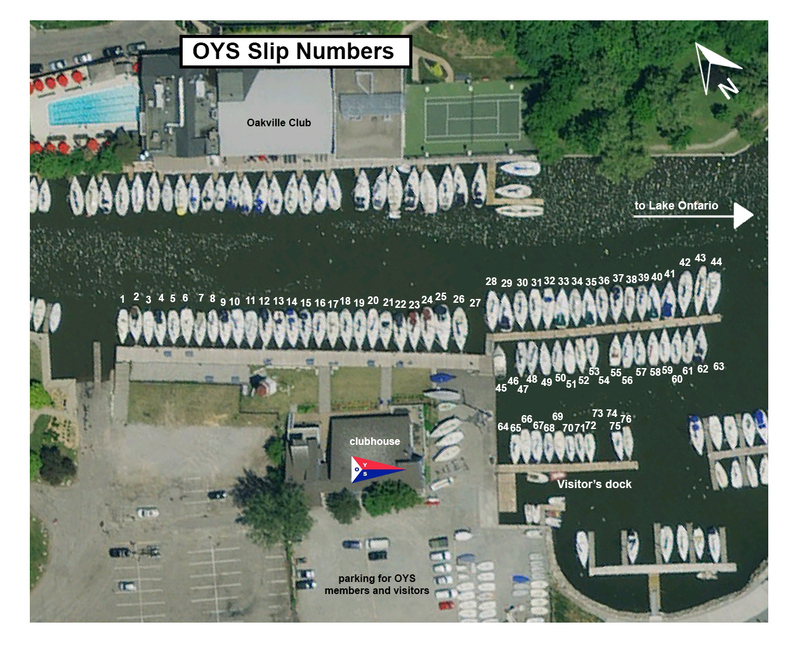 OYS has 76 mediterranean style slips available to it's members, and welcomes visitors to occupy vacant slips as our members are out exploring Lake Ontario. Please make sure to sign in. 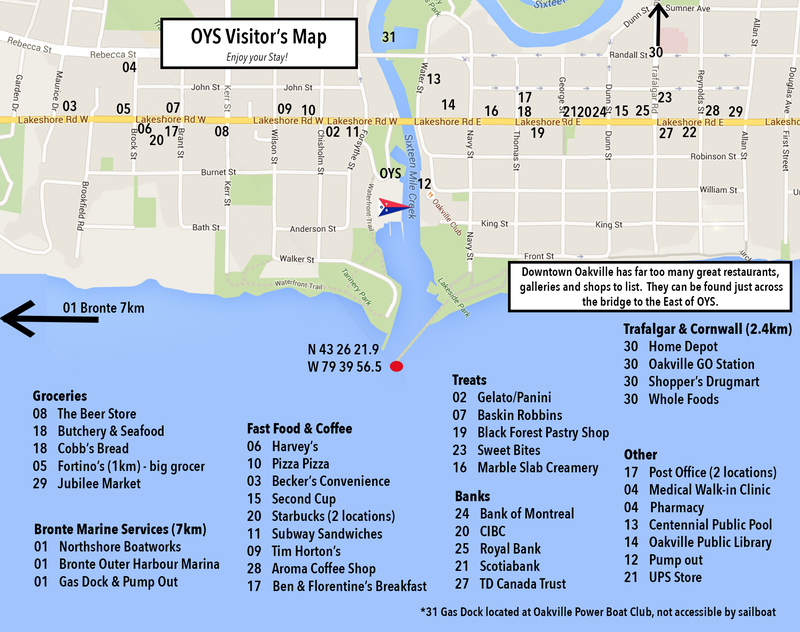 OYS is located at 97 Forsythe Street, Oakville. 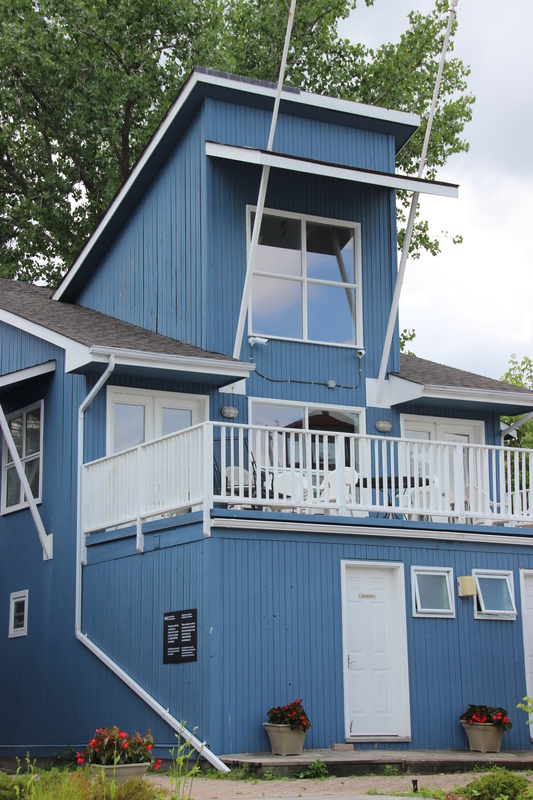 If you are coming by boat, the Oakville Lighthouse (FR) on the south end of the east pier is N 43 26 21.9 W 79 39 56.5 - follow the signs to the visitor's dock. OYS is steps away from picturesque downtown Oakville, which is filled with a delicious selection of restaurants and boutique shops. OYS is governed by Ontario Laws which designate certain areas where smoking is prohibited. Please click to see our diagram of permissible smoking areas.